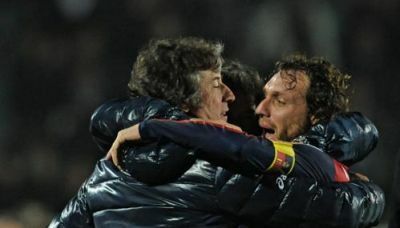 Genoa 2012: Gilardino and Marino arrived !! The whole summer the newspapers told us that Alberto Gilardino the famous striker of Fiorentina and the Italian National team would come in Genova, but at the end we had to be happy with Andrea Caracciolo of Brescia. Andrea gave us a fantastic point in the new Juventus-stadium to score the late equalizer but unhappily this was his only golden moment. Today Caracciolo was hired to Novara and at the end of the morning Alberto Gilardino arrived at the medical centre in Albaro, one of the best areas of Genova. 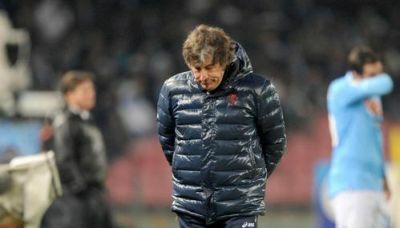 Monday or Tuesday we expect ‘Gila’ for the first training with our new trainer: Pasquale Marino who substitutes Alberto Malesani who was fired one day after the horrible match in Napoli: 6-1 defeat. Marino is born 49 years ago in Marsala on the island Sicily. He trained several teams like Foggia, Arezzo, Catania, Udinese and Parma. With Udinese he reached the Europa League, the same result we like at the end of this season. Lots of success Alberto and Pasquale! Within 24 minutes the score was 3-0 and Mr. Preziosi stopped watching the match and decided in his car to look for a new trainer. Our President missed the first goal of Jorquera with Genoa, the only positive thing this horrible match. Just before halftime Igor Pandev scored 4-1 and in the second half we were happy that Napoli was satisfied with only 2 extra goals, otherwise it would be an even more dramatic result. 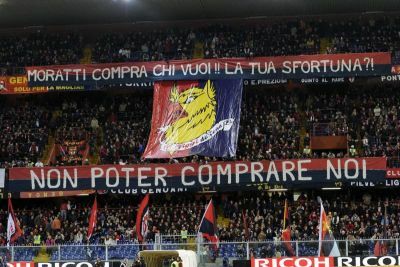 Genoa ends 2011 on the 10th position in the standings with 21 points in 16 matches. As we all know Rodrigo Palacio is very important to Genova. Without ‘the train’ Genoa hardly scores. Today against Bologna the former team of Mr. Malesani we needed the points to stay close to the Europa League-zone. 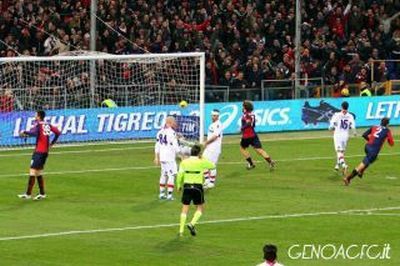 In the first half Genoa took the lead by a dubious goal of Marco Rossi. At the beginning of the second half the deserved draw of Bologna came with a goal of Ramirez. After our ex-player Marco di Vaio hit the far post it was Lucas Pratto who gave us 5 minutes before the end the 3 points by scoring his first Italian goal in front of Gradinata Nord. A very important match to the standings, 1 match before the end of this year. The match that was postponed at 6th November because of the flood, this time without the Dutch Genoani. With 5 defenders and only 1 striker (Zé Eduardo) Mr. Malesani believed in a miracle. Happily Diego Milito refused to score against us (and the team of his hart), so halftime arrived with 0-0. At the beginning of the second half Genoa played more offensively and scored with a header of Andrea Granqvist, but the goal was cancelled because of off-side. On the other side Japanese midfieldplayer Nagatomo headed the ball behind Frey and this goal was regular to referee Banti. With 0-1 the expected defeat arrived, maybe Mr. Malesani next time better can try to score to give the public a more interesting match and to have a real chance to win. Unfortunately we had to play against Milan in a bad period of Genoa and a very strong period in the season so far of Milan. In the first half our defenders resisted, but 10 minutes after the break the match was decided. Referee Celi gave Kaladze his second yellow card and Zlatan Ibrahimovic realized the penalty: 0-1. 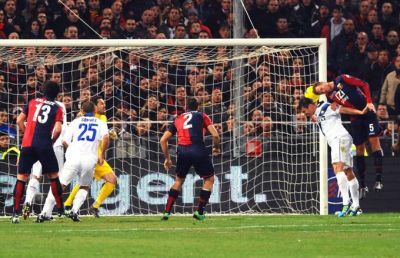 Unless the squalification of Palacio Genoa tried to score the equalizer, after the debut of Zé Eduardo Milan keeper Amelia was finally under pressure, but a few minutes later Nocerino scored the second goal: 0-2. After this defeat Genoa is back at the right (so wrong) side of the standings. 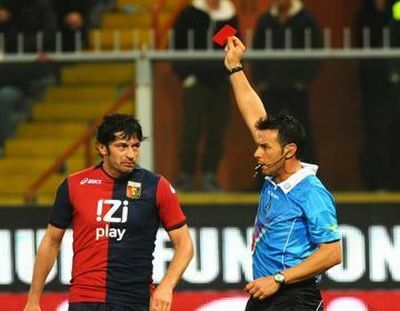 Tomorrownight Genoa plays in Luigi Ferraris against champions of Italy: A.C. Milan. For the first time this season Zé Eduardo is selected, but probably only to be part of the team and not because he is already able to play. Mr. Malesani has offensive problems with the squalification of Palacio, our only top-striker in the team. Let’s hope this time offensive midfieldplayers like Merkel and Jorquera can score the goals. Kakhaber Kaladze and Alexander Merkel of Genoa and Marco Amelia of Milan play against their old team.